We're a little team working on the realisation of an old school Beat'Em'Up injected large doses of epinephrine and psychedelic trips. The game's mixing the classicism of Street of Rage and the supercharged violence of Hotline Miami. We're trying to give a feeling of romping, trance, anxiety and unease, all in the cold and harsh climate of an alternate U.S.S.R. 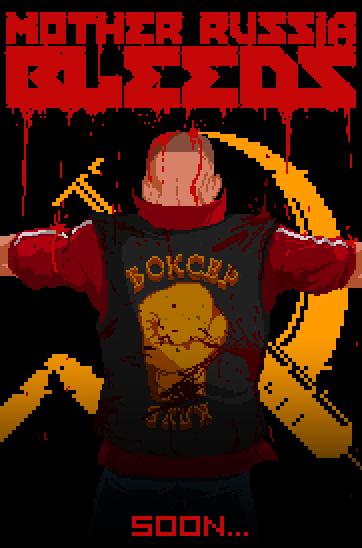 Welcome in Mother Russia Bleeds. Le Cartel team came into being in September 2013. when a team of four independent developers and artists with complementary skill sets decided to join forces and see if they had the chops to create a great game by themselves: "Mother Russia Bleeds". The game they wanted to create was one that harkened back to the golden age of the Beat ‘Em Up genre. And there, Frédéric Coispeau met Alexandre Muttoni, a web artistic director who also wants to make his own indie game. They began by working on the game universe and defining the art direction of our game. A few weeks later, Florian Reneau, recently graduated from the school Isart Digital, joined the project as game programmer. Finally, Vincent Cassar, composer of FIXIONS is in charge of the OST. There are far more images available for Le Cartel, but these are the ones we felt would be most useful to you. If you have specific requests, please do contact us! "Mother Russia Bleeds, le beat'em all qui bouscule les codes !" "Mother Russia Bleeds, sexe, drogue et baston." "It's the darker, macabre side of the game that really grabs me."